Comprising of distinctive outdoor lounge pieces that are bound to turn heads, you will find inspiration with our entire lounge range. We design our furniture to be the centre of attention, with a specific focus on comfort and style. The elegant and stylish hand-woven Sophia armchair is suitable for both outdoor and indoor use. 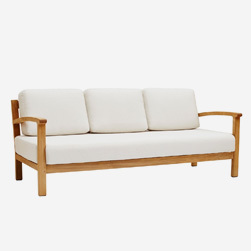 Made especially for tight spaces, the Jasmine Two Seater is a petite sized sofa that is deceptively comfortable. Beautifully crated ‘slabs’ of timber work together to form a stylish and sturdy piece.